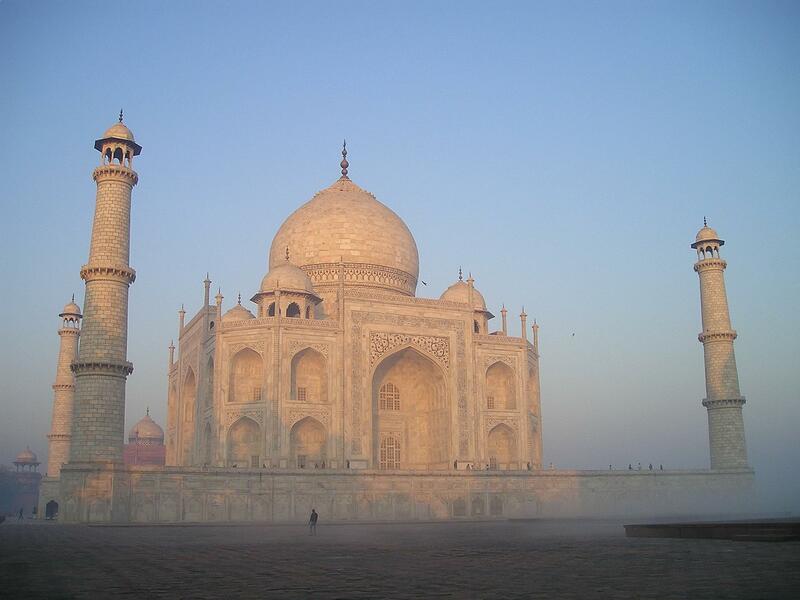 The Taj Mahal often called “Crown of Palaces” situated on the bank of the Yamuna River in the Indian city of Agra. One of the wonders of the world was commissioned by the Mughal Emperor Shahjahan in the year 1632.The Emperor has dedicated it to his favourite wife Mumtaz Mahal. It is now a symbol of love and millions of visitors from the globe. It also comes under UNESCO World Heritage Sites. A unique feature of the Taj is the different shades of the monument. It is pinkish in the morning, milky white in the evening, golden when the moon shines and shades are also different in different seasons of the year. When you are roaming into the monuments there are much related to Mughal Emperor Shahjahan and his wife Mumtaz Mahal will occupy your mind and you will be able to feel their love. The monument is a masterpiece of Mughal architecture and one of the best tourist places in India. The entry fee for the monuments has three categories, foreign tourist will have to pat Rs 750 and for the Local people, it is Rs 20. If the visitor is Citizens of SAARC and BIMSTEC Countries then he or she has to pay Rs 510. Also, read about natural wonders in India. Varanasi also was known as Kashi situated on the banks of the holy river Ganga. It is also one of the oldest cities in the world. Varanasi considered to the spiritual capital of India and one of the holiest of the seven sacred cities in Hinduism, Jainism, and Buddhism. The city is also famous for its muslin and silk fabrics, perfumes, ivory works, and sculpture. It is said that ‘Benaras is older than history, older than tradition, older even than legend and looks twice as old as all of them put together’. The scenic beauty of the Ghats and temples seems very beautiful. The devotions in the River Ganges at sunrise will give you a lifetime memorable experience. There are approximately 2 thousand temples in the city and most visited one is Kashi Vishwanath Temple or ‘Golden Temple’ dedicated to the Hindu god Shiva and they are one of the most amazing temples in India. The walk along the Ghats and the boat ride will live long in the memory. India’s current Prime Minister Narendra Modi is an MP from the holy city. Also, read about things to do in Kashmir. Jaisalmer city is located on the westernmost frontier of India in the state of Rajasthan. The city is famous among the visitors because of its proximity to the Thar Desert. A camel safari in the sand dunes of Jaisalmer will give you the lifetime experience. The city is very close to the border with Pakistan. It is also a world heritage site. The city stands on the yellowish sandstone of beautiful Fort which contains many palaces and certain Jain temples. The city is very beautiful and diverse. Also, it will give you a lifelong memory along with your family.Khezada, Bavla, Lora, Rohida, Van, Phog, Kumbhar, Jal, Neem, Babul and many other trees are to be found among sparse vegetation. Jaisalmer has a very dry climate with very hot summer; a cold winter and sparse rains. The climate is extremely hot during summer with the maximum temperature reaching up to 49.2 degrees Celsius and extremely cold during winter with minimum temp in the range of 1 degree Celsius. Also, read about tourist places to visit in Rajasthan. The Ajanta Caves located in the Aurangabad district of Maharashtra are the 30 rock-cut Buddhist cave monuments dated back to the 2nd century. The paintings that are there on the wall are one of the finest examples of the Indian art. The caves are built in two phases, the first one starting from the 2nd century and the second part around 400-650 CE. It is very much protected monument taken care by the Archaeological Survey of India. It is also a UNESCO world heritage site. Along with the Ellora caves, Ajanta is also one of the major tourist attractions in India. The caves were abandoned until 650 AD then the British hunting party explored them. The painting is very well preserved and is still there depicting everything from the battlefields, sailing ships and city streets. So, go and visit the well preserved historical place and get a lifetime experience. Also, read about tourist attractions in London. The Harmandir Sahib also known as the ‘Golden Temple’ is the holiest Sikh Gurudwara located the in the city of Amritsar. The Golden Temple was designed by the fifth guru of Sikh named Guru Arjan. Harmandir Sahib is one of the best tourist attractions in the Amritsar city. Guru Ramdas Ji commenced the construction of the holy monument in the 16th century. The place and the city are very famous among the visitors around the globe. The upper floor of the temple was covered with Gold and it was done by the Maharaja Ranjit Singh. The Sikhs from all over the world visit daily in order to show devotion to the Sri Harmandir Sahib in their Ardas. One of the best Tourist Places in India. Palolem beach located in South Goa and also one of the most beautiful beaches in India. The beach can also be seen in the Hollywood movie The Bourne Supremacy as a home of the Jason Bourne (Matt Damon). The landscape of the beach is very beautiful and eye capturing which will give a long memory. Both the ends of the beach consist of rocks. The beach is safe for the average swimmers as the depth of the sea increase very gradually making it shallowest at the northern end of the beach. The island is very beautiful with tree covered rocks and beach shacks. You will also enjoy reading about beautiful waterfalls in India. Kanha National Park generally known as Kanha Tiger Reserve is the largest national park in the state of Madhya Pradesh of India. This is one of the best places to see Tiger in India. The most attractive place in the park is Bamni Dadar where you can watch the beautiful sunset with grazing sambars and gaurs. The frequent sighting of the Tigers is also one of the main attractions of the park. It is also one of the most well maintained National Parks in Asia. This park has a good population of different animals like Royal Bengal tiger, Indian leopards, the sloth bear, barasingha and Indian wild dog. The National Park is also home to 1000 species of flowering plants. Virupaksha Temple is located in the city of Hampi. It is 350 KM from Bangalore. The temple is also a UNESCO world heritage site. The temple has been dedicated to Lord Shiva. It is one of the oldest Hindu temples in the world dated back to 7th century AD. It has been started as a small shrine and the maximum growth was under the Vijayanagara rulers. The main temple is east facing and has two main courtyards one leading to another. The temple is very beautiful with the old carvings on the wall which looks incredible. The landscape beauty of the temple is also very amazing. One of the most visited Tourist Places in India. We also recommend you to read about beautiful villages around the world you must visit once in your life. Also, read about places to visit in Bangalore with friends. It is also known as Jab Niwas. Lake Palace is a luxury hotel with 83 rooms and white marble walls. The hotel has been situated in the middle of the Lake Pichola in Udaipur. There is a service of speed boats which is operated by the hotel management to carry the guest from the hotel at the City Palace. The hotel has been rated as the best romantic hotel in India and also in the world. Let’s talk about the history of the luxury hotel; it was built between 1743 and 1746 on the orders of the Maharana Jagat Singh II. The palace has been constructed in the east direction so that inhabitants can pray to Surya. The hotel is indeed very beautiful and the landscape beauty is just amazing. Also, read about coldest places in India. Kerala backwaters are a chain of brackish lagoons and lakes. They lie parallel to the Arabian Sea coast also known as Malabar Coast in Southern India. The whole network has five large lakes connected through the canals. The canals are both manmade and natural. The backwater in lakes formed by the waves and shore currents that will create unique barrier islands across the mouth of many rivers. The scenery is just amazing and the landscape is very beautiful that will rely on your memories for a very long time. It is also compared to the American Bayou. Ashtamudi Lake is the most visited of the lakes among all the lakes and it covers an area of 200 square kilometres. One of the best Tourist Places in India. Alleppey listed under one the most beautiful canal cities in the world. Thank you so much Pradeep :). Few months back I think you were in Agra so you didn’t get time to visit taj? and do visit Varanasi too the spiritual capital of India if you get another chance to visit Agra. I can’t igonre any place from list as all are best of best place to visit.I liked picture a lot.